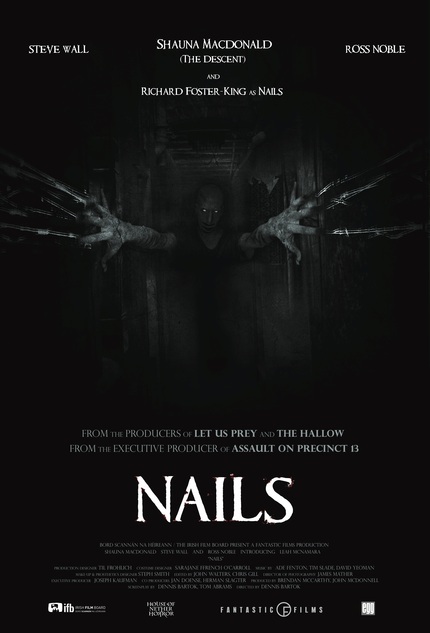 Fresh out of post-production in Ireland, we have your exclusive first look at the poster for Dennis Bartok's new horror film, Nails (formerly known as POV). Bartok shot his film in Ireland with The Descent star Shauna Macdonald in the lead, alongside British comedian Ross Noble and Richard Foster-King as the titular phantasm, Nails. Nails marks the first feature directed by Bartok, but he's hardly a new name in the film community. He previously came to prominence as a programmer at the American Cinematheque in Los Angeles before helping to found North American distributors Cinelicious Pics, who helped share films like Gangs of Wasseypur and Belladonna of Sadness with the US. He's also co-author of the recent boo A Thousand Cuts, that takes an in-depth look at the bizarre underworld of 35mm film print sales and trading. He's now back at the Cinematheque as the general manager as well as staying on at Cinelicious Pics as an Acquisitions Executive, all while preparing his debut feature to share with the world. From producers Brendan McCarthy and John McDonnell at Dublin-based Fantastic Films (Let Us Prey, The Hallow) and executive producer Joseph Kaufman (Assault on Precinct 13), the new Irish horror NAILS is the debut feature from writer / director Dennis Bartok (producer of anthology horror Trapped Ashes, American Cinematheque and Cinelicious Pics executive, author of A Thousand Cuts: the Bizarre Underground World of Collectors and Dealers Who Saved the Movies). Dana Milgrom (Shauna Macdonald, The Descent) is a track coach and mother who’s survived a near-death car accident, only to find herself paralyzed and trapped inside her own body. Forced to communicate via an artificial voice program and hooked to a breathing machine, she becomes convinced that a terrifying presence called Nails exists inside her hospital room. No one believes her – not even her own husband, who thinks she’s experiencing a mental breakdown. As her marriage disintegrates and her grip on reality starts to shred, Dana fights to convince the doctors and staff that Nails is real and intent on destroying her. In the vein of recent films like The Babadook, Nails is part of a new wave of horror that puts female characters and their emotional lives at the center of the storyline. The film co-stars acclaimed British comedian Ross Noble (Stitches), Steve Wall (of Irish band The Stunning), Leah McNamara, and Richard Foster-King as Nails, with cinematography by James Mather (Frank), and music by longtime Gary Numan collaborator Ade Fenton. Take a look at the new poster for Nails, and for a high-res version, be sure to click the image below. Dennis Bartok's P.O.V. Wraps Production, Check Two Pieces Of Exclusive Concept Art Now!